You can use a timer on your pond. Not true! Your pond is a living, breathing ecosystem that needs constant oxygen, just like the human race. If you shut your system down at night, then you can never have sufficient growth of beneficial bacteria to fight algae blooms and your finned friends will have a hard time breathing. You can shut down a Pondless waterfall system, however, whenever you’d like because plants and fish are not depending on the circulation for oxygen and nutrients. It’s necessary to drain and clean your pond regularly. 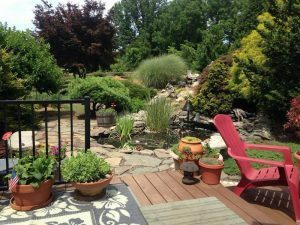 If you decide to work in harmony with Mother Nature, using the five-part recipe, instead of doing battle with her, then draining and cleaning your pond should take place only once a year (at most). Clean outs should occur in the spring, before the weather gets warm and the bacteria has an opportunity to set up. Believe ir or not, you can over-filter a pond. Tight filter pads in your skimmer pick up the smallest particles of debris, causing you to be cleaning the filtering mechanism out constantly. Fish in the wild certainly don’t swim around in bottled water. If you can see a dime on the bottom of the pond, then the water clarity is just right for your fish and filtering past that create headaches, not eliminate them. Not true! You can raise koi and have a beautiful water garden. The koi can grow up to be just as beautiful and just as healthy as they are in traditional koi ponds and you’ll love them just as much! Raccoons generally won’t swim. That’s not to say they never swim, or couldn’t stand on the side of your pond and take a paw swipe or two at your fish. Fortunately, most fish will swim to a deeper, more protected part of the pond when a predator is threatening them. The one predator with legitimate credentials is the blue heron. The Scarecrow, a motion-sensing sprinkler that can be set up alongside your pond, ready to fire a steady stream of water at a heron, has had some degree of success in warding off these curious critters. Plenty of lily pads give them some protection and will work to minimize attracting a heron in the first place. Other protection measures include a cave-like structure that can be built in during the pond’s excavation, or if you already have a pond, they can be added with a little pond remodeling. Crevices, or miniature caves, can also be created within the rock walls of your pond. Yes, you will have more leaves in your pond in the Fall but, by the same token, the shade provided by the tree(s) will help minimize the algar bloom in the summer. Furthermore, if you have a skimmer sucking the top quarter inch of water off the top of your pond, it will pull most of the leaves and related debris into the skimmer net. It’s natural to have these thoughts and concerns, but it is important to remember that a professionally installed water garden has steps leading into the pond. The first shelf is only ankle high once the gravel is laid down. The next shelf is up to your knee, while the smallest area in the bottom is just above your knee, so it is not constructed like a swimming pool. We do recommend that you make your neighbors aware of the water garden and educate your own children and friends about the safety of any body of water. If liability is a true concern, consider the option of a Pondless Waterfall. Concrete-lined ponds are better than flexible liner ponds. 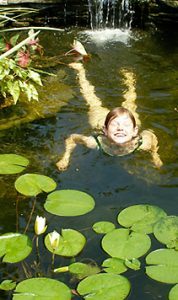 Many pond builders still believe that liner ponds are a much cheaper material for water features and do not hold up too well. We have many liners over 20 years old in the field. Concrete is prone to damage from severe cold and cracking. Liner is also cheaper to install than concrete. Koi and gravel do not mix. Koi are bottom feeders just like their cousins the Carp. They love to swim along the bottom and scavenge the bottom looking for food mixed in the gravel. There are usually rocks in our lakes and ponds. It is more like their natural environment than an exposed liner. Chemicals are okay to use in your pond. There are many chemicals available to treat you all your pond ailments. Although some treatments may be necessary, it is best to create a natural environment and let nature take care of your pond. It is best to attack the root problem rather than a quick fix. You need to drain and clean your pond regularly. If your pond is set up properly with adequate filtration and is working in harmony with Mother Nature, then draining and cleaning your pond should take place on once a year in the Spring. Clean outs should occur in the Spring, before the weather gets warm and the bacteria has time to set up. 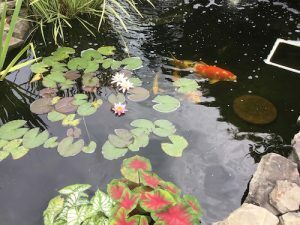 The Pond Doctor is Northern Virginia’s leading aquascape contractor, offering Pond Installation & Design Services, Pond Maintenance, Repair and Cleaning Services throughout Fairfax County, Loudoun County, and surrounding areas. Call us today at (540) 272-6866 to get your pond questions answered or schedule an appointment with your local aquascape professional.